More than 50 items listed in our List of What to Sell at a Flea Market. 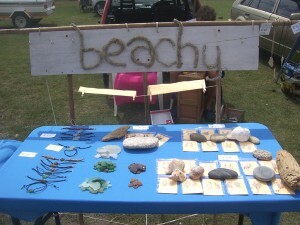 We’ve made this list of what to sell at a flea market or craft market for ourselves, but since we like to help others with thinking of work from home ideas through the articles we write and publish on some of our sites, we thought to share our list of ideas here on Beachy too. More than 50 items listed in our List of What to Sell at a Flea Market, further below! 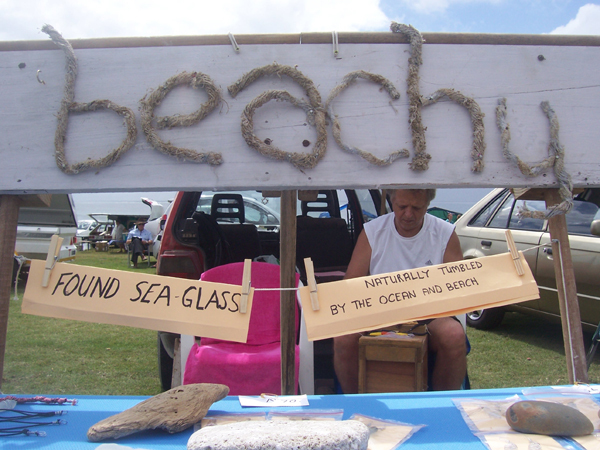 Beachy flea market stand at the East London beachfront in South Africa, in January 2013 – clearly stating that the sea glass in our products is found sea glass, naturally tumbled by the ocean and beach. 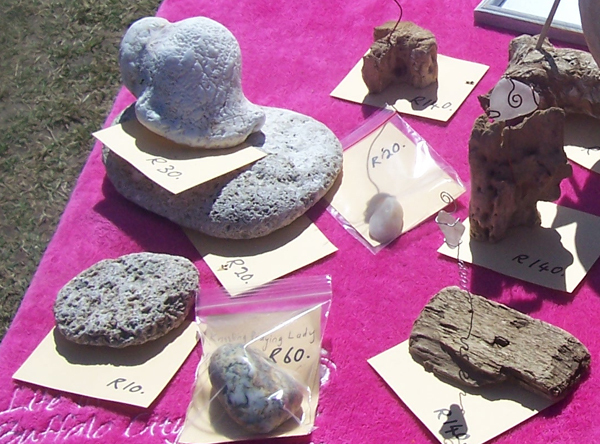 Other than the kiddies tie-dyed tshirts, all items below could be decorated in something you’ve found while beachcombing at the beach, for example decorated in pieces of sea glass. If using seashells, pebbles or small pieces of driftwood, first check with your town or country’s laws about what you can or cannot remove from the beach, and if you can sell any items that you remove from the beach. The reason why we don’t want to add small items like pieces of sea glass to kiddies tie-dyed tshirts is that little children may fiddle with them or try take them off, and there’s a risk of choking if little ones put small objects in their mouths. Our list (further below) contains very few things we’ve already made (because we haven’t made such a wide variety of products – yet! ), but we know that we can make all of the things in this list of what to sell at a flea market, and we look forward to finding the time to make them all. Besides recently taking an interest in beachcombing, sea glass, and beach photography, we’ve also recently taken an interest in making friendship bracelets using mostly a macrame making technique, and we have also taken an interest in weaving. 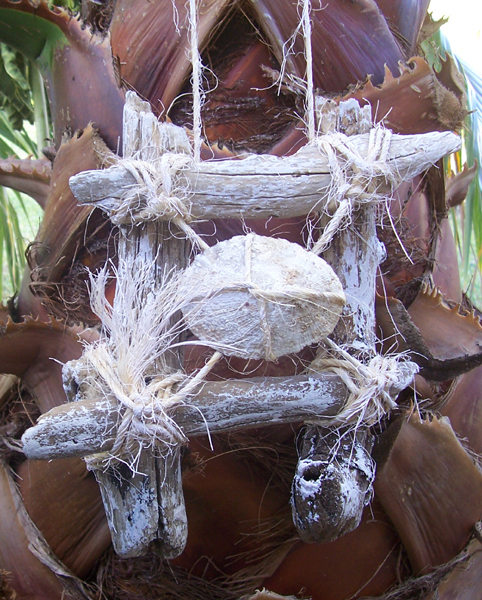 This interest in weaving allowed us to add more products to our Beachy line of products that we still wish to make, as listed in the list further below. Sea glass clasp for homemade woven handbag – this is the first little handbag I made, in January 2013, on a homemade weaving loom, made from a cardboard box. I did the bag and straps. 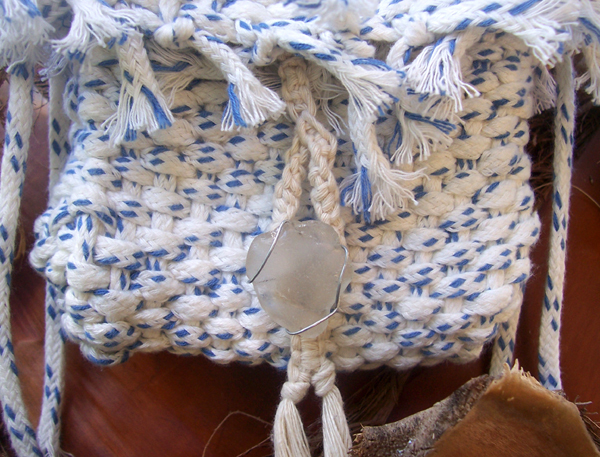 Tony made and added a macrame “button hole” and piece of white sea glass for the bag’s clasp. Am keeping this woven bag for myself, as want to improve my weaving skills before we sell any of our little bags. It’s a small bag, just big enough for a phone, lip gloss, and a really small purse, perhaps. 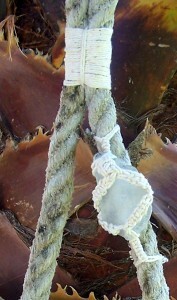 If you’re good with knots, and have some old rope, make a monkey’s fist knot, as seen below, and decorate part of the tail end part with sea glass or other items. 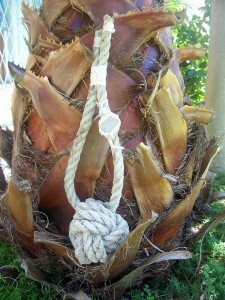 A monkey’s fist knot ornament could be a garden ornament, a patio ornament, an ornament displayed in the house, or used as a doorstop. MORE THAN 50 ITEMS IN THIS LIST! 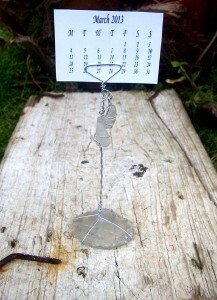 Wire Note Photo Holder with white sea glass – for messages, or small laminated photos, or calendar months – stands about 12cm high to the bottom edge of the calendar. Whether you’re interested in making extra income or not, or interesting in selling something at a flea market or not, crafts are relaxing and can help you save some money by making some items for yourself or your own home, or by making items to give as gifts. If you want to make some extra income for yourself, get started making some of the items in this list, and get yourself off to a flea market or craft market as soon as you have enough stock. Just think, if your cost to make one item is as little as only R5, then if you could make 20 of those items all in one week, your cost is only R100 (plus time spent on making your products and preparing the products for selling), and then if you’re lucky you sell them all at a flea market that weekend, at perhaps R75 each, that’s R70 per item profit, for 20 products = R1 400, less petrol and cost of flea market stand space being perhaps R80 depending on how far away you stay from the flea market or craft market venue, and depending on the cost of the flea market stand space for the morning or day = R1 320 profit for a week’s worth of making 20 items. Disclaimer: this is just an example of how much money you might make – it depends on all sorts of things – how many people visiting the flea market buy your things, the cost of your materials or products, your transport costs, flea market stand space costs, and your selling price, for example. Just take a little picnic table with if you have no gazebo, or even display your products on a pretty blanket or oversized beach towel on the grass. If you don’t sell anything the first time, or sell only one or two of your products, don’t give up! Spend time planning better for your next trip to the flea market, and work on ways to make your flea market stand more attractive – also, you may want to try more than just one flea market venue in your area.